Mad about Mushrooms . . .: Know Before You Go; Be Careful What You Read! Know Before You Go; Be Careful What You Read! It's finally fall, and we're all elated about strolling into the woodlands for the first of the mushrooms that the rain has to offer. It's been a long wait for the season to start, and the hunt excites us as deeply as it did the very first time. was my first edible of the fall season. But beware: there may be false information lurking out there about rules and regulations and permits on National Forest lands. Be careful about your information sources. Check and double check to be sure you know the legal requirements concerning the location where you'll be exploring for mushrooms. This caution was underscored today when I was volunteering at the Battle Rock Visitors Center in Port Orford. As is my custom at the beginning of my shift, I perused the literature in the display cases to discover any brochures that may have been added since my last shift. 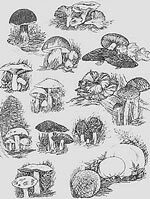 What a great resource, I thought, when I came upon a gray colored tri-fold entitled "Mushroom Guide - Rogue River-Siskiyou National Forest Gold Beach Ranger District" which was credited to the United States Department of Agriculture - Forest Service. Gathering mushrooms in the Rogue River-Siskiyou National Forest is a natural activity for folks in southwestern Oregon and northern California. This 1.8 million acre forest extends from the crest of the Cascades Mountains west into the Siskiyou Mountains almost to the Pacific Ocean, and includes portions of the Applegate and Illinois River drainage system. This pleasure soon dissipated as I examined the brochure. My first tip-off that something might be amiss was the lack of a publication date on the brochure. There was nothing to indicate that the permit and pricing information was current. My second clue was that even though the brochure stated that "A permit is required to harvest mushrooms on the Rogue River-Siskiyou National Forest," it did not list the locations for purchasing a permit. Not very useful! There is a wide variety of mushrooms that are common on the Rogue River – Siskiyou National Forest that may be harvested for your personal use without a permit. You may harvest up to one gallon per day within the five gallon yearly limit. Under incidental use NO MATSUTAKE mushrooms may be harvested...Materials gathered under Incidental Free Use cannot be sold or exchanged in any form. According to the USDA's permit website, commercial mushrooming permits for Matsutake are $10/day while other mushrooms are $2/daily. A 6 month all mushrooms seasonal permit is $150. The brochure that was displayed so predominately at the Visitors Center had very different permit lengths and prices. It is the responsibility of the harvester to stay current with updates. ...call ahead to make certain that the product you are interested in is available and that someone will be available to help you before you visit a Forest office to purchase a permit...Prices are subject to change without notice as they are re-appraised to reflect market changes and/or harvest costs...Be aware that the availability of products is often limited and availability may change as often as daily depending on the product. A pictured United States federal or state identification card or a foreign Passport is required to obtain a permit. Each individual person harvesting special forest products must obtain a permit; only the person on the permit may harvest products. The individual obtaining the permit must be present and must be a minimum of 18 years of age. For a full and lengthy statement of the conditions, go to the "Permits" section on their website. 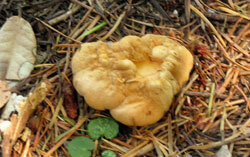 Mushrooms gathered under incidental harvest are for personal use only. Selling or exchanging mushrooms gathered incidentally is a violation of Federal Regulations (Title 36 CFR 261.6F), punishable by a fine of not more than $5,000 or imprisonment for not more than 6 months, or both. Sounds a little steep to us. What say you? Oh, in case you're concerned, I should conclude this post by stating that the remaining USDA gray tri-folds have now been removed from the Battle Rock Visitors Center. We don't want to perpetuate the confusion that could arise from this outdated publication. A footnote: We disagree vehemently with this whole thing; it is, in our view, a complete waste of taxpayer money and a vast bureaucratic boondoggle. We would hate to think of how many government employees are "toiling away" at our expense selling permits, let alone enforcing these ridiculous regulations. It makes us bristle with anger. But... we don't make the rules (trust us: they would be vastly different - and briefer - if we did!). We are here to inform our readers, whether we agree or disagree with the rules. And that is what we have done here. It's your choice: thumb your nose at the rules, skip the process, and hope you don't get caught, or grit your teeth and go along.